The AVCE Student Branch of IEEE jointly organized a Technology Introduction Program with IEEE ADSF SIGHT at Thoothoor on 10-04-2017. In the program a newly developed mobile app called “Fishers' Guide” was introduced to the fishermen of Thoothoor. The functioning of the app which is in the development stage was explained to the fishermen and the fishermen suggested inclusion of some additional features. Mr. I. Tamil Selvan, Chairman of the branch welcomed the gathering. Mr.Vincent Jain, Chairman of IEEE ADSF SIGHT and Mr. G. Gaswin Kastro, AVCE SB Counselor also addressed the gathering. 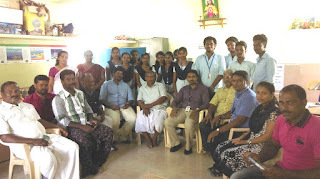 Students of Annai Vailankanni College of Engineering has been developing a mobile application called “Fishers' Guide”. This app can be used by the fishermen to know the weather, potential fishing zones, wind speed and other parameters. This app is being designed such that the users can be monitored from the shore. This will help the users to get assistance soon at the time of distress and other critical situations. This program enabled interaction between the fishermen and the app developers. The fishermen found the app to be much useful and suggested some more features to be included in the app. The app was installed in the mobiles of fishermen so that they can be monitored during their voyages. This program was also helpful for the app developers to make their final design more efficient.